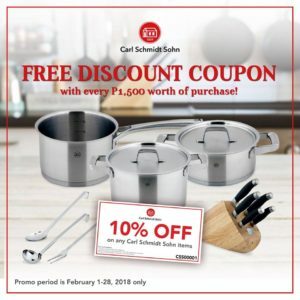 FREE Discount Coupon with Carl Schmidt Sohn! | Much Prosperity Trading International Inc.
FREE Discount Coupon with Carl Schmidt Sohn! Turn a simple meal into a culinary masterpiece using Carl Schmidt Sohn’s wide variety of kitchen products! Visit Rustan’s (Alabang, Makati, Shangri-La Plaza and Cubao), True Home (Robinsons Magnolia and Greenbelt) and True Value (Shangri-La Plaza, Alabang Town Center and Rockwell) and get FREE Discount Coupon with every P1,500 worth of purchase.